Urad dal is one of the priced dals of India and Andra is one of the biggest producer. Used a lot in entire south india in preparations like idli , dosa and vada. But punjab's use it lot too in preparations like maah ki dal and dal makhni. Urad dal vada is prepared all over India. Vada with a center hole is the trade mark of south indian urad dal vada . But north india vada is made without a hole. Dahi vada is a integral part of north indian feasts. Dahi vada is sometimes stuffed with nuts and dry fruits. Soak the urad dal for 45 min - 1 hrs. Grind it to a smooth paste using 1/4 cup water. Fluff the batter well using a hand or electric whisk. Drop a small bit of dough into a bowl of water and check if it floats. If the batter floats it is ready to to be deep fried. Heat oil to 350 F and drop small balls of batter . Deep fry till golden and drop in salted warm water. Mix salt, sugar, water and curd and whisk well. Take the vadas out from salted water . Press the vada between the palm and squeeze out the water. Arrange the vadas on in a deep tray and pour the curd over it. Sprinkle with chilli and roasted cumin powder. And pour the the tamarind chutney. 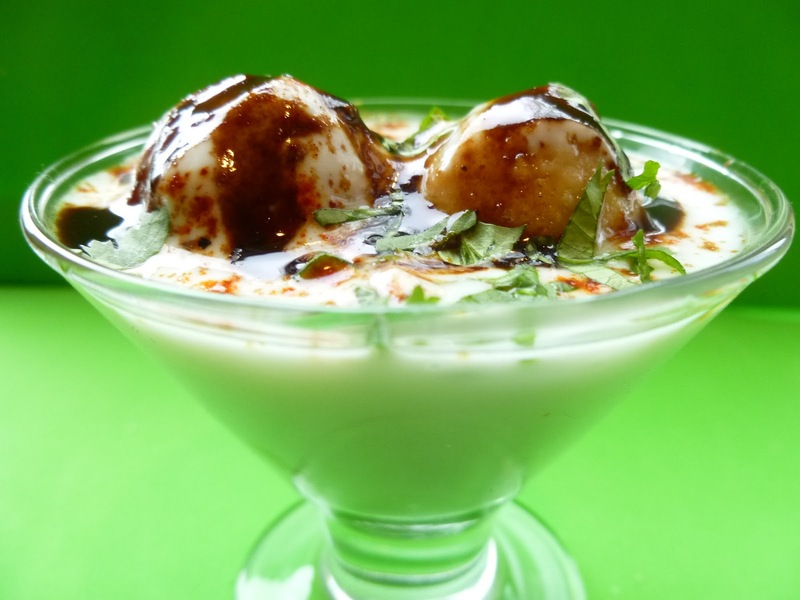 oh now i am craving for dahi vadas..looks so tempting..
Omg, wat a beautiful click,love this dahi vada very much.